On Sunday it was Zack's birthday. It worked out great that we could have his family party on his actual birthday! This year he requested a Disney "Planes" theme. 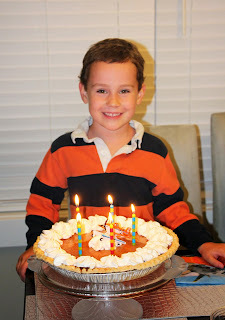 He also wanted chocolate cupcakes and pumpkin pie for his birthday dessert. Great! I was happy, both are super easy to do. Another one of Zack's requests was a surprise party. He knew we were having a party, so that wasn't much of a surprise, but I convinced him that it would only be the 7 of us (our family, plus Grandma & Grandpa). Michael took Zack with him to pick up dinner and when they got back, my parents and grand parents had arrived, so we jumped out and yelled "surprise!". After dinner I planned a little game for the the 5 oldest kids. They had clues to find, until they found their treat bags.